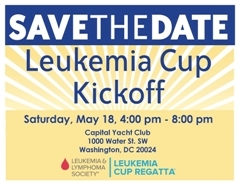 The Kickoff Party for the 2013 Leukemia Cup will be held on Saturday, May 18, 4:00-8:00 p.m. at the Capital Yacht Club. Come on out to enjoy some fine food and drink in support of a great cause, and start your fundraising for the 2013 Leukemia Cup Regatta! RSVP to Brianna Walsh at brianna.walsh@lls.org / 703-399-2930. I just wanted to pass along the final fundraising total, along with a big “thank you!” from the Leukemia & Lymphoma Society for those who raced, raised funds, and generally supported the LLS mission at the 2012 President’s/Leukemia Cup. All told, we helped the LLS raise $142,000 in support of their work to research and cure blood cancers! Many thanks to all of the PRSA sailors who raised funds in support of this fine cause, and congratulations to anybody who braved the conditions on Saturday to race on the first day of the President’s/Leukemia Cup. For those boats that raised funds and also raised on Saturday, the LLS Racing Awards (based on Saturday’s racing results) will be presented at the 2012 PRSA AGM. 2012 President’s/Leukemia Cup: What A Blast! Saturday saw breezes of 15-20 kts with gusts to 30. Rigs came down, boats were upside down, and crews were swimming. Thankfully everybody made it through safe and sound and we were all on shore when the storm front (with 50+ kt winds!) hit. Unfortunately, that storm meant that the Leukemia/Lymphoma Society had to shut down the party before fundraising and racing awards were handed out and before the raffle and silent auction winners were announced. We’ll pass along updated information from the LLS as soon as we receive it, including any information concerning prizes or awards you may have won if you were fundraising for LLS. Sunday ended up being a gorgeous day with a 10-12 kt NW breeze, wonderful sunshine, and great racing. The RC did a great job in getting us four races and we all enjoyed a nice BBQ after the racing. Make sure to post your own comments and recollections from the weekend below! Register now for the 2012 President’s/Leukemia Cup! Online pre-registration for the 2012 President’s/Leukemia Cup is now up and running! You can pre-register your boat and, if you wish to raise funds to support the Leukemia and Lymphoma Society, simply indicate this preference on the PRSA pre-registration form. The regatta will be held on September 8-9 this year. We’ve posted the link to the PRSA pre-registration form, a list of key dates, and all the rest of the relevant info to the President’s/Leukemia Cup page. You can also access this information by clicking the “President’s/Leukemia Cup” link above on the top navigation menu. If you have any questions, feel free to contact your PRSA Rep to the LLS, Aaron Boesenecker. Need a good reason to show up for Wednesday night sailing? Take a look at these great photos of Mike Heinsdorf and new Albacore convert Seth blasting around the cove! Hope to see you all out there next Wednesday! In the interest of building bridges with our fellow sailors across the river, I’m sharing this great opportunity from DC Sail – a rules seminar with Chris Petracco, the Race Administration Director at US Sailing. Tickets are $30 and proceeds will benefit youth sailing. The rules seminar should be good, the scotch tasting is a nice touch, and attending the event will give you a chance to chat with other sailors (and potential members!) about PRSA and our great fleets as well! Fall Series #7: Another spectacular day of racing! Fall Series #7 was another great day on the river, with 4 races and a good turnout all around. It was predominantly a Lightning affair, with 10 boats showing up to race. A couple of Bucs and Albacors also came out to play, and with all fleets starting together we had a lively starting line and good racing all day long. I’ve included my observations from the Lightning perspective below. Keep reading for all of the details and, as always, be sure to contribute your own comments and recollections! Fall Series #6: A bit chilly, but some great racing! I think that the last thing that folks thought as they watched the snow swirl down last Saturday was that we’d get in 5 races under a sunny blue sky and in temps that were much milder than the frostbiting conditions we all expected! As it turns out, Fall Series #6 ended up being another fantastic day of sailing as PRO Ron Buchanan and his RC got us 5 races and then had us back on shore in time to enjoy some cold beers and hot dogs around the grill. Read all about the racing below – hopefully the writeup will spark your appetite for some great racing in Fall Series #7! Also, be sure to post your own comments and recollections, especially if you were one of the Albacores or Buccaneers that came out on Sunday! Fall Series #5: If you went home early, you missed some great sailing! I’ll admit, I was the first to think that we’d never sail on Sunday. Having seen the forecast, the glassy calm river on my drive along the GW Parkway, and the somber faces at the marina, it seemed clear that we’d postpone a bit, then end up grilling and going home. Well, let me just say that if you went home early, you missed some of the best racing that we had all season. The wind filled in around noon, we headed out to the river, and Mike Heinsdorf and his RC did a great job of getting us 3 excellent races! I’ve included here a wrap up of the days racing (which proved to be quite challenging and exciting) from Jeff Storck in the Lightning fleet. Jeff, Becky, and Bruce on Team Ariel won the day with two seconds and a spectacular bullet in the second race, and Jeff has sent along an excellent writeup of his “view from the front” – a view that he enjoyed far more than most of us on Sunday! I highly recommend that you click the “continue reading” link below to read Jeff’s reflections on Sunday’s racing; as always, I’ve learned something from Jeff’s account of the racing, and I’m sure that you will as well. It’d be great to hear from anybody else that was out on the river, as we did have a couple of Albacores, a Buc, and a handful of Hobies out racing as well. The PRSA Fall Series #4 was primarily a Lightning class affair, with 5 boats coming out to race and 2 taking care of RC duties (and another 7 representing Fleet 50 up in Annapolis at the Frigid Digit regatta). For the second weekend in a row we had great conditions for racing, with a 12-15 knot SW breeze that allowed PRO Frank Gallagher and his RC to get us four races. Jeff Neurater came out to represent the Buccaneer fleet, Mike Heinsdorf was out in his Albacore, and a trio of Hobie Cats also came out to play. Keep reading for some more details from Sunday’s Fall Series #4 (from my vantage point in the Lightning fleet), and be sure to post your own comments and observations from the day (just click the little “speech bubble” next to the title of this post, above). You can also scroll down a bit to see a separate post with details from the action up in Annapolis at the Frigid Digit.